One of the questions that I receive most often is about the description of eagles carrying their young on their wings. The nesher, king of birds, is the most prominent bird in the Torah. Although many assume that the nesher is the eagle, and some of the commentaries have identified it as such, the evidence shows that it is more likely a vulture - specifically, the griffon vulture (see full essay here). The conventional translation of va'esa eschem is "I carried you." However, some translate it as "I elevated you." The explanation is that the nesher is the highest-flying bird, and God raised the Jewish People to spiritual heights above anything in the natural world with His miraculous redemption. The highest flying birds are griffon vultures. The description here is of the nesher carrying its young upon its wings while flying. Many have considered this verse to present us with a great difficulty and to require some kind of allegorical or poetic interpretation, since neither vultures or eagles are generally known to carry their young on their wings. Swans and other waterfowl sometimes carry their young on their backs while swimming, and jacanas and bustards may sometimes carry their young between wing and body while walking. There are reports of some ducks taking flight while their young are on their backs. A further report concerns an obscure water bird from Central and Southern America called the sungrebe, which carries its twin young in pouches under both wings. True, these reports have not been widely confirmed, despite extensive studies of these species. Furthermore, these reports concern eagles, whereas evidence shows the nesher to be the griffon vulture rather than the eagle. However, it is possible that such rare behavior likewise occurs with griffon vultures, or that nesher is a generic term encompassing both eagles and griffon vultures. 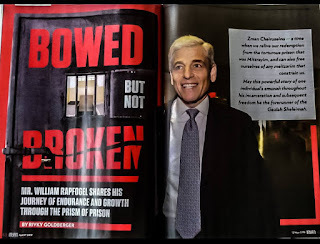 Another solution to the entire question is to posit that "the Torah speaks in the language of men," which, according to one school of thought, means that it packages its messages within the scientific worldview of the generation that received the Torah. For more on this approach, which has been used by several recent and modern authorities to explain other phrases in the Torah that are scientifically inaccurate (such as references to the "firmament," the hare bringing up its cud, the dew falling, and so on), see my essay "The Question of the Kidneys' Counsel." 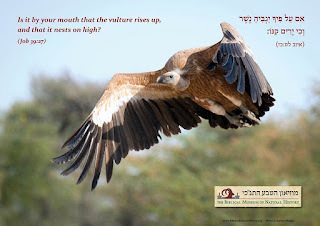 If referring to a griffon vulture, these verses show that the vulture is regarded by the Torah very differently from the way that it is perceived in contemporary culture. While people today view the vulture in a negative light, the Torah presents it as an example of a loving and caring parent. This also relates to the vulture's entire parenting process. Female griffon vultures usually lay one egg, which both parents incubate for an unusually long period of around seven weeks until it hatches. The young are slow to develop and do not leave the nest until three or four months of age. The long devotion of the vulture to its young symbolizes God's deep dedication to the Jewish People. See HaKesav VeHaKabbalah ad loc. See Johnsgard, Paul A. and Kear, Janet, "A Review of Parental Carrying of Young by Waterfowl" (1968). Papers in Ornithology. Paper 32. http://digitalcommons.unl.edu/biosciornithology/32. Also Celia K. Falzone. 1992. “First Observations of Chick Carrying Behavior by the Buff-crested Bustard”. The Wilson Bulletin 104 (1). Wilson Ornithological Society: 190–92. http://www.jstor.org/stable/4163135. See Johnsgard and Kear, ibid. This remarkable phenomenon was first reported in 1833 by the German ornithologist M.A. Wied. Subsequent generations of ornithologists viewed this report with skepticism or ridicule. However in 1969 Mexican ornithologist Miguel Alvarez del Toro confirmed that soon after hatching, the male sungrebe places each of the two chicks in pouches under his wings and departs. An article by B. Bertrand explains: "M. Alvarez del Toro, who observed a nesting pair in Mexico, discovered that the male has a shallow pocket under each wing into which the two young can fit. The pocket is formed by a pleat of skin, and made more secure by the feathers on the side of the body just below. The heads of the chicks could be seen from below as the bird flew. Alvarez del Toro collected the bird in order to examine it and confirm the unlikely discovery. Subsequently, he found it confirmed also by a report published by Prince Maximilian of Wied 138 years earlier but apparently ignored, forgotten or not believed. This adaptation is unique among birds: in no other species is there any mechanism whereby altricial young can be transported...." Bertrand, B. C. R. (1996) Family Heliornithidae (Finfoots) in del Hoyo, J., Elliott, A., & Sargatal, J., eds. Handbook of the Birds of the World. Vol. 3. Lynx Edicions, Barcelona. It sounds from the accounts you bring that these people were Christians who were trying to find a way to fit in their observations with the Torah. If that's the case I'm afraid very little evidence can be bought from their account. It may also be simple poetic license. Pshat, as you know, if often not literal, but metaphorical. Men speak of "taking someone under his wing" as a metaphor for caring. The Prophet may simply be speaking of the way the mother bird cares for its young, in a similar vein. With the widespread availability of portable video recording devices, these questions should be come resolvable. The example loses its point if it refers to unusual behaviour, or a species that was unknown at the time. If we are open to interpreting the verse contra Rashi, there is another solution: the Torah never says that. "Like a vulture" may simply refer to "stirs up its nest, flutters over its young", which vultures actually do. Then, having begun in an avian vein, the metaphor continues with God "bears [them] on His pinions". The Exodus verse says nothing about vulture behaviour; it simply cites the vulture as an example of a bird with impressive wings. The second pic is so beautiful. Love to see the bird in person. You are my strength my God﻿.